Feeling frazzled? Stressed out from work? School getting to you? Having a hard time falling asleep at night? We all have times in our lives where we need a little extra something to help us unwind and relax. There are also times when we just need a little extra self-love and care when life gets crazy. Yoga has many tools to offer in the way of dialing the nervous system down, which will help you ease your way into some rest and recovery. Here are my top 5 yoga poses for chilling out when I feel frantic and the need to recover. This is my absolute favorite restorative posture. Lying flat on the floor with your legs extended and resting along the wall has many physiological benefits. First, it will help to take the pressure off of sore, tired legs and feet. Having your legs raised up over your heart can help to reduce painful swelling and irritation. This position will also help to calm and soothe the nervous system. Staying in this pose for 10-15 minutes before bed will have you falling asleep with ease. This forward fold is one of the most calming and cooling for the mind. The inward folding action is one of the most commonly used actions in yoga for calming. If you are able to rest the forehead onto something while you are in this pose, the calming effects will be amplified. Using a bolster or a few folded blankets to crate a space for your head to rest in this posture will help you release. My favorite uttanasana variation for relaxation is to stand with my feet hips distance apart, knees slightly bent, draping my upper body over my legs, allowing my spine to stretch out fully. I then will cross my arms to take a hold of opposing elbows with my hands. This is a wonderful way to create space in your back and neck and to create that inward fold that is so calming for the brain and body. 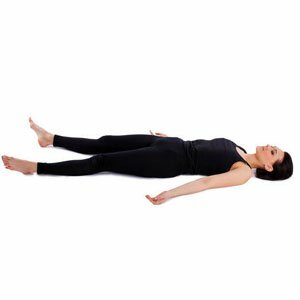 Gravity will do its work drawing your torso into towards your legs, and this can help to create a deep feeling of grounding. Taking Balasana with knees spread wide apart so that there is space for your belly to relax towards the floor is extremely restorative. In this pose, you get the inward folding action, as well as the nice easy pressure on your forehead, which helps to settle and calm the mind. This pose is also amazing if you have tighter hamstrings, because you get a foreword fold without needing to have openness in your back body. This pose is amazing any time of day when you need a quick rest to re-charge your batteries. This is the ultimate resting pose that requires that you focus your mind to stillness. In Savasana, you are fully releasing all muscular engagement, allowing the floor to hold you. This is incredibly conducive to relaxation. This pose is different from sleeping because you are allowing your body to fully release, while keeping your mind awake. Truly practicing Savasana—either by focusing your mind upon your breath, upon a mantra ,or upon releasing focus altogether—will be invaluable for you if you have a lot of stress in your life. Learning to release both physically and mentally will increase the rest in your life dramatically. What do you like to do when you are feeling wound up? Are any of these postures your go to postures?